Tip performed “We Will Not” and took the opportunity to make a statement. At the BET Hip-Hop Awards Tuesday night, naturally, the reality of ongoing police violence against black Americans loomed heavy. Early on, the show featured impassioned speeches and meditations from Big K.R.I.T., Sway, and Bay Area spitter Locksmith, but it was T.I. who spoke on the issues most prominently, performing his protest anthem "We Will Not" from the politically charged Us Or Else EP. "United we stand. 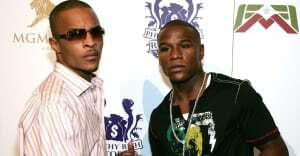 Look around and see the power around you," Tip told the crowd, "We gotta stand together, it's us or else. It's do or die. The time is now. They can't kill us all." Watch the clip above via BET.